Chris Dutcher and study principal investigator Dr. William Wilcox talk about Hunter Syndrome and this Phase I clinical trial. 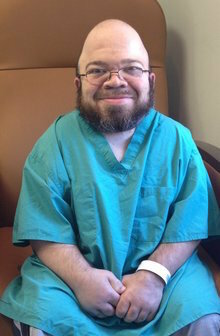 A first-in-man clinical trial, testing a newly developed drug for a rare genetic condition called mucopolysaccharidosis type II (MPS II) or Hunter syndrome, is underway at Emory University. MPS II or Hunter syndrome is an inherited disease in which long chains of sugar molecules, known as mucopolysaccharides, are not broken down correctly in the body. A deficiency in the enzyme iduronate-2-sulfatase (I2S) causes the problem. Without enough I2S, partially broken-down mucopolysaccharides accumulate in the organs and tissues of the body and become toxic. An enzyme replacement medication called idursulfase or Elaprase (brand name) has commonly been used to treat Hunter syndrome, but it does not cross into the brain to treat the most severe cases of Hunter. Now, Emory researchers are testing idursulfase fused with an antibody developed by ArmaGen, Inc., to create a new method of delivery that will include the brain. This is the first time this medication combination, called AGT-182, has been tested in a human. "We are using a technique where the enzyme replacement therapy has been attached to an antibody to the human insulin receptor, in an effort to move across the blood-brain barrier and be able to treat the brain," says William Wilcox, MD, PhD, professor in the Department of Human Genetics, Emory University School of Medicine and principal investigator of this clinical trial. "If this works, this is a brave new world that we're entering into in genetics where we can treat many diseases that involve the brain that we could never treat before." Chris Dutcher, who was diagnosed with Hunter syndrome when he was six years old, is the first to test a newly developed drug for the rare genetic disorder. Chris Dutcher was diagnosed with Hunter syndrome when he was six years old. He is now 31. Dutcher's symptoms include significant bone disease, short stature, stiff joints, an enlarged liver and spleen and difficulty breathing. "By testing this new medication for the first time in a human, my hope is to help children with severe Hunter syndrome," says Dutcher, whose younger brother also has the same disorder. Dutcher has the mild version of Hunter syndrome, but the symptoms are still quite serious and can involve the lining of the brain and spinal cord that are not treated by Elaprase, but may be treated AGT-182. The severe form is diagnosed in a child's first few years of life and can lead to progressive and profound intellectual disability and eventually death. In this multicenter Phase I safety and efficacy trial, the study medication will be administered intravenously once a week for eight weeks. Researchers have previously found that if given early enough, enzyme replacement therapy alone can delay or prevent some of the symptoms of Hunter syndrome. However, benefits in cognitive function have not been seen with intravenous enzyme replacement therapy. Boys are affected by the disease, which is usually passed on by mothers who carry the gene. "With an X-linked condition such as Hunter syndrome, the mom is usually a carrier," says Stephanie Cagle, genetic counselor and study coordinator at Emory. "Then with every pregnancy, if she's having a boy, there's a 50 percent chance that her child will inherit the carrier gene and develop Hunter syndrome." There is no cure for Hunter syndrome, a lysosomal storage disease brought on by a deficiency in a single enzyme in the cells. The syndrome affects one in about 100,000 males.